FORT LAUDERDALE – “You are able to write your own ticket”. That should be the slogan for Uber. It was a hazy Sunday – May 29th, 2016 and with just one one cruise ship in Port Everglades set for a late afternoon departure, Uber Partners must find new ways to make money and maximize their profitability on the Uber Partner app in the “so-called slow season”. The peak of the cruise season is mid-February when on any given Sunday, there are 8 – 9 cruise ships including the MS Allure of the Seas, one of the largest cruise ships in the world embark with thousands of passengers. 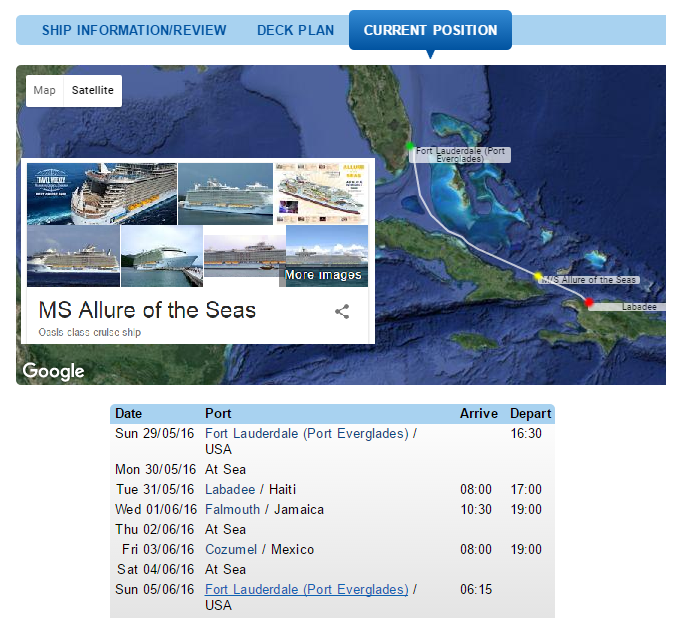 Royal Caribbean’s MS Allure of the Seas is on a 7-day cruise with itinerary including exotic points of calm stops in Labadee, Haiti, Falmouth, Jamaica and Cozumel, Mexico. In South Florida, the cruise industry is vital to the profitability of Uber Partners. Cruise passengers fly into Fort Lauderdale-Hollywood International Airport from all around the world to embark on cruises to the Western and Eastern Caribbean. According to a recent Sun-Sentinel article, the Miami and Fort Lauderdale ports are among the three busiest recreational cruise ports in the world. With one ship and a lot of hustle, I was able to produce $186.90 plus a $10 tip from “Mr. W” who is a passenger on the MS Allure of the Seas. Mr. W is a great guy. He dropped off his rental car at the main garage at FLL and I received his request to take him back to the MS Allure of the Seas to meet his family. He is celebrating his Silver Anniversary with his family. We talked about Guavate, a special place in Puerto Rico known for pork and possible bailout of Puerto Rico debt crisis by the United States Government. Great conversation. Great times! Congratulations “Mr. W” on your Silver Wedding Anniversary! Thanks to his $10 tip, I was able to boost my profitability and conversion for the Sunday with a free 1/2 tank of gas. Tips are great news for Uber Partners. It means free gas and pure net daily profits on the Uber Partner app. 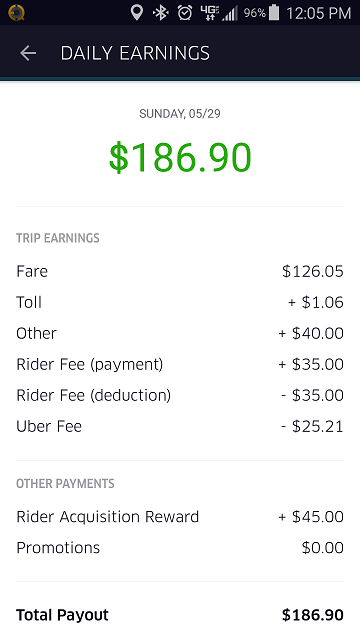 Hazy $200 Sunday Uber profits with just MS Allure of the Seas in Port Everglades was further boosted by three Rider Acquisition Rewards for $45.00 credited to my account by Uber and a miscellaneous credit of $40. There are some great income verticals with the Uber Partner program — most notably rider referrals and driver referrals! It is not enough to just set a goal for the week. With Uber, you should set your goal on a daily basis. Do you simply want to make at least $100 a day net? Or perhaps you are willing to do whatever it takes to make $150 a day on the Uber Partner app. Set your daily goal and and your work ethic will dictate the course of the entire week for making money with the Uber Partner app. You can easily average $100 – $150 a day net with Uber! Never start the day thinking about how other Uber Partners complain that it is the so-called slow season. You can get great fares at any time of day! Whether its a couple traveling all the way out west to Sawgrass Mills Mall from the Hollywood Boardwalk to kill time on a rainy afternoon or a rider going all the way up to Boca Raton from a marina to her braces dental exam, people make long trips on Uber 7-days a week.